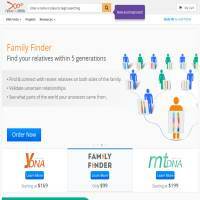 FamilyTreeDNA offers paternal, maternal and ethnic ancestry testing solutions for a reasonable price. It holds the world’s largest ancestry DNA database and allows you to transfer data from your 23andMe (v3) or AncestryDNA accounts to help trace your lineage. A selection of resources, including a learning center, forums and a glossary, are also available. There are a variety of DNA tests available, which can help you to trace your existing family tree or to better understand your ethnic ancestry. The Family Finder helps you to locate family matches and ethnic percentages (the variety of ethnicities which you’re made up of). There are three father’s line tests which also allow you to access group projects and communicate with experts on your particular lineage. You can get updates on results as they arise and chat to a genetic genealogist in a free webinar session. In 2013, a DNA sample was submitted to FamilyTreeDNA for analysis and shown not to relate to anything on record. As reported in New Scientist, a team of geneticists at the University of Arizona in Tucson carried out further investigations on the DNA sample and found that the Y-chromosome tree actually stretched almost 340,000 years into the past. Up until those findings, geneticists had only traced the Y-chromosome tree back to genetic “Adam”, who lived between 60,000 and 140,000 years ago. Uploading DNA samples to services such as FamilyTreeDNA can help geneticists to make new and exciting discoveries, as well as helping individuals discover more about their own ancestral lineage. Two mother’s line DNA tests are on offer, including a full sequence test. This package offers similar benefits to the full father’s lineage tests. In short, you don’t just get the test result, you also receive a means of analyzing your results with a specialist. Browsing the website is free, which allows you to access the extra resources available. The Learning Center is essentially just an FAQ, offering information on how to pick a DNA test, how to order, the testing process and more. FamilyTreeDNA’s forums are used regularly, with new messages and exchanges each day. You can talk about general interest topics such as Genealogy for Beginners, or more specific site-relevant issues. This is a good area to find answers to any questions you might have, or to share research. The site also hosts blogs and outlines some of the projects available, such as transferring or posting a GED COM file. If you’re new to genealogical research, or just need to brush up on a few terms and what they mean (which can be particularly useful if you don’t fully understand your test results) then the online glossary could come in handy. There are quite a few complaints about the speed of DNA test result deliveries. The system isn’t always quick, so be prepared to wait. If you’re in a hurry you may wish to decide to use another DNA testing website, or to contact the sales team to see whether your results can be fast-tracked. FamilyTreeDNA.com doesn’t offer many additional tools, and despite the name you cannot actually build a family tree through the website. If you’re hoping to find additional research, other than DNA test results, you’ll need to look elsewhere. Prices are reasonable for the tests, but you may need to wait a while. If you’re okay with this, and aren’t interested in learning much more about your ancestry than the facts hidden away within your genes, then Family Tree DNA might be a site worth considering.